Wayne celebrated his 60th birthday at Back of the Moon, Gold Reef City. The theme was music and the table decor was black and white with music notes and feathers. I was delighted when Lisa asked me to do these cupcakes for Wayne’s birthday. The cupcakes were apple cupcakes with a rich cream cheese icing. 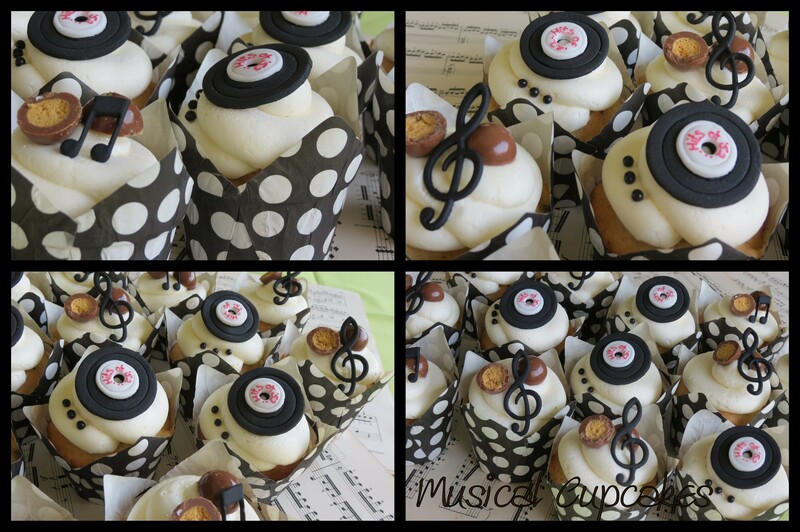 I added chuckles and music notes to some of the cupcakes and then made sugar paste records, titled ‘Hits of ’62’, to the others and finished off with a few black beads. They turned out toe-tappingly tasty! In keeping with the theme Lisa made Wayne a brilliant photo album with records as the cover. Once again she gave a hand made and totally unique gift (you never cease to amaze me Lisa with your creativity and enthusiasm for surprising your family and friends). Happy birthday Wayne and I hope these cupcakes added to all the fun you had celebrating with your family and friends. Works of art babes, you never cease to amaze me with your creativity!!!! Thanks Babes for all the support and encouragement and tasting of course! Thanks Lisa(TQO), had fun doing these for you. Absolutely amazing – as always!! !